COSTA MESA, CA--(Marketwired - October 07, 2015) - Addressing customer demand for miniature high frequency oscillators in LVPECL and LVDS logic types, Ecliptek Corporation has added four new Temperature Compensated Crystal Oscillators (TCXO) and four new Temperature Compensated Voltage Controlled Crystal Oscillators (TCVCXO) to its comprehensive frequency control product offering. The eight new oscillator series deliver excellent performance, including frequency stability options as tight as ±1.0ppm in a 2.5mm x 3.2mm ceramic six pad SMD package. These new Ecliptek TCXO and TCVCXO series are well suited for PCI express, SONET/ATM/ SDH equipment, and cable modem products. Design teams developing frequency modulation/demodulation, synthesizer clock and PLL circuits can capitalize on the superior phase noise performance of the new oscillator products. 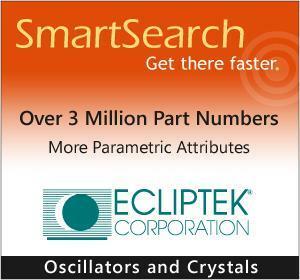 Part number specific information derived from these new series is integrated into Ecliptek's interactive website tools, including the SmartSearch and My Parts List apps. Ecliptek's advanced self-service documentation tools provide easy access to Data Sheets, REACH, RoHS, China RoHS, IPC-1752 Material Declarations, Qualification and Reliability Reports, and Conflict Mineral documentation on over 3 million verified Ecliptek part numbers.